AP School Education is decided to conduct the common summative Assessment-1 from 12-11-2018 to 29-11-2018 for High schools and SA-1 from 22-11-2018 to 27-11-2018 for Primary schools.. All the Headmasters are instructed to follow the Time table communicated by the Andhra Pradesh State Council for Education Research and Training SCERT, Andhra Pradesh state. released Common Time Table to conduct CCE Summative Assessment SA 1 in AP. 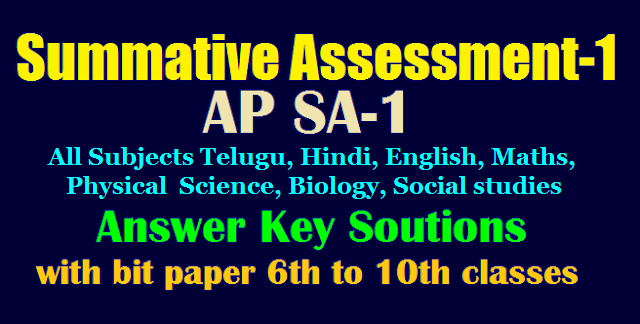 Summative Assessment 1, Summative 1 , SA 1 Telugu,Composite Telugu, hindi, Urdu, Tamil, Kannada,Oriya Answer Key Sheets, Summative 1 Principles of Evaluation for 6th,7th,8th,9th,10th Class,Telugu, Urdu, Tamil, Kannada,Oriya Summative Assessment 1, SA 1 2018 March Answers for 6th,7th,8th,9th,10th Class, SSC / X 2018 Telugu Summative Assessment 1 , SA 1 2018 March Principles of Evaluation,Telugu,Composite Telugu, Urdu, Tamil, Kannada,Oriya Answer Key Sheets,Summative assessment, SA1 , Telugu 2018 march paper 1 and paper 2 classwise Answers Download for 6th,7th,8th,9th,10th Class, AP SA1 All Subjects Telugu, Hindi, English, Maths Physical Science, Bio Science , Social Studies November 2018 APSCERT Official AnswerKey Sheets for SSC/ 10th Class,9th,8th,7th,6th Principles of Evaluation.